Niningerite: Mineral information, data and localities. After Harvey Harlow Nininger (1887–1986), of Sedona, Arizona, USA, for his contributions to meteoritics. D : With Sn, Pb, Hg, etc. Clinoenstatite 1 photo of Niningerite associated with Clinoenstatite on mindat.org. Klaus, K. and K.G. Snetsinger (1967) Niningerite: a new meteoric sulfide. Science: 155: 451-543. Abstracted: American Mineralogist (1967): 52: 925. Osborne, M.D. and Fleet, M.E. 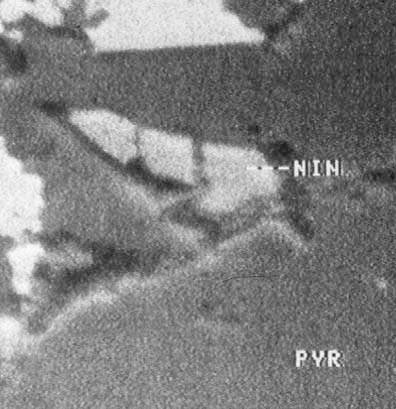 (1984) Mössbauer investigation of niningerite slid solutions (Mg,Fe)S. Physics and Chemistry of Minerals: 10: 245-249. DAWSON, K.R., MAXWELL, J.A. & PARSONS, D.E. (1960): A description of the meteorite which fell near Abee, Alberta, Canada. Geochimica et Cosmochimica Acta 21, 127-144. Leitch, C.A. and J.V. Smith (1982) Petrography, mineral chemistry and origin of type I enstatite chondrites. Geochim. Cosmochim. Acta, 46, 2083–2097. Fleet, M.E. and MacRae, N.D. (1987) Sulfidation of Mg-rich olivine and the stability of niningerite in enstatite chondrites. Geochimica et Cosmochimica Acta: 51: 1511-1521. Ehlers, K. and A. El Goresy (1988) Normal and reverse zoning in niningerite: a novel key parameter to the thermal histories of EH-chondrites. Geochim. Cosmochim. Acta, 52, 877–887. National Bureau of Standards Circular 539, 7, 31. Pekov, I. (1998) Minerals First discovered on the territory of the former Soviet Union 369p. Ocean Pictures, Moscow; American Mineralogist, Volume 93, pages 902–909, 2008; Isa, J., Ma, C., & Rubin, A. E. (2016, March). Joegoldsteinite: A New Sulfide Mineral (MnCr2S4) from the IVA Iron Meteorite, Social Circle. In Lunar and Planetary Science Conference (Vol. 47, p. 1813). RUBIN, A.E. & KEIL, K. (1980): Mineralogy and petrology of the Abee enstatite chondrite. Meteoritics 15, 358-359. SHIMIZU, M., YOSHIDA, H. & MANDARINO, J.A. (2002) The new mineral species keilite, (Fe,Mg)S, the iron-dominant analogue of niningerite. Canadian Mineralogist 40, 1687-1992. Ramdohr, P. 1972. The highly reflecting and opaque components in the minerals content of the Haverö meteorite. Meteoritics, vol 7,N:o 4 December 30, 1972. T. J. McCoy (1996). A Pyroxene-Oldhamite Clast in Bustee: Igneous Aubritic Oldhamite and the TI Enrichment in Aubritic Troilite. Meteoritics & Planetary Science 31, p. A86. LEITCH, C.A. & SMITH, J.V. (1982): Petrography, mineral chemistry and origin of Type I enstatite chondrites. Geochimica et Cosmochimica Acta 46, 2083-2097. Péter Németh, Stephen W. Lehner, Michail I. Petaev, Peter R. Buseck (2013): Kumdykolite, a high-temperature feldspar from an enstatite chondrite. American Mineralogist, 98, 1070-1073.; Gannoun, A., Boyet, M., El Goresy, A., & Devouard, B. (2011). REE and actinide microdistribution in Sahara 97072 and ALHA77295 EH3 chondrites: A combined cosmochemical and petrologic investigation. Geochimica et Cosmochimica Acta, 75(11), 3269-3289; Lehner, S. W., Nemeth, P., Petaev, M. I., & Buseck, P. R. (2013). Origin of Fine-Grained Albite in an EH3 Sulfidized Chondrule. LPI Contributions, 1719, 2500.; Lehner, S. W., McDonough, W. F., & Németh, P. (2014). EH3 matrix mineralogy with major and trace element composition compared to chondrules. Meteoritics & Planetary Science, 49(12), 2219-2240. Paul Ramdohr (1972). The Highly and Opaque Components in the Mineral Content of the Haverö Meteorite. Meteoritics 7, No.4, 565-572. (Dec 1972). Robert A. Fogel (1994). Aubrite basalt vitrophyres: High sulfur silicate melts and a snapshot of aubrite formation. Meteoritics 29, #4, 466-467.